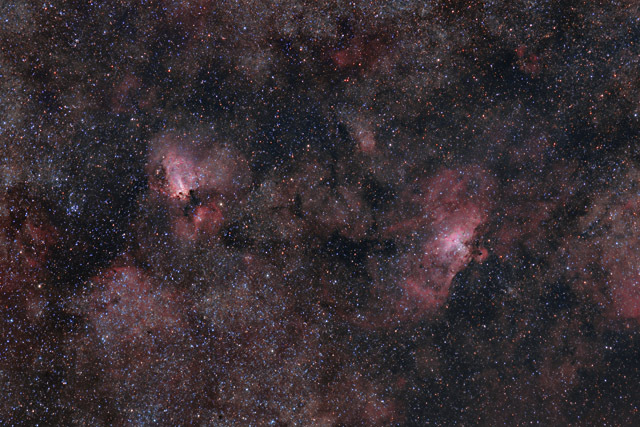 Strattling the constellations of Sagittarius and Serpens, this widefield image features two beautiful emission nebulae, M16 (the Eagle Nebula) and M17 (the Swan Nebula). M16 is renowned for its beautiful Pillars of Creation that were made famous when the Hubble Space Telescope published its fascinating image of that region. Like M16, M17 is another region of active star formation. Also known as the Omega nebula, the Checkmark Nebula, and the Lobster Nebula, M17 is also the second brightest source of radio energy in the sky. In this image, I blended 27 hours of Hydrogen Alpha data taken with a wide field 200mm lens along with detail images of M16 (8 hours) and M17 (13 3/4 hours) taken through my Celestron C8 at 1160mm. The detail images were RGB (color) images that I converted to greyscale and then layered into the H-alpha data. Then, I combined the enhanced Ha with 11 hours of RGB data of the wide field to create this HaRGB composite representing 60 hours of imaging. In this image, North is to the left. This image is cropped to 83% of the original frame. Software Used Images Plus 5.5 for camera control, calibration, stacking, and digital development. Images Plus 5.75 for feature mask, star masking, smoothing and noise reduction, and star shrinking. Photoshop CS5 used for levels and curves, hue/saturation colorizing, hue adjustments, lab color, selective color, high pass filter, and unsharp mask. Gradient Xterminator for gradient removal. Registar for registration and stack alignment. Carboni Tools for additional noise reduction and smoothing. Focus Magic for focus restoration. HLVG for additional color adjustment. Notes I was very happy with my Ha image, but I had a lot of trouble trying to combine the Ha with the RGB color image. I had given up on it and was happy to have a beautiful greyscale Ha image. However, I let the data alone for a couple of weeks and then came back and took another stab at it. Eventually, I was able to combine the Ha and RGB and end up with colors with which I was happy. I'm glad I gave it the second effort, as the resulting image looks pretty good to me. I guess the lesson I learned was that some times it pays to just walk away from the data for a little while. This image won first place in Astrophotogallery.org's Easy-Widefield category for November 2013. This image was published in the Fall 2014 issue of Amateur Astronomy Magazine in my article entitled "Processing Wide Field Images: The Taming of the Stars".